Chip Chantry is a television writer and stand up comedian. He has written for the first season of Crazy Talk, a comedy/talk series for NBC Universal and the syndicated series Whacked Out Sports. He was the winner of 2013’s Philly’s Phunniest Contest at Helium Comedy Club, where he is a regular performer. Chip also won the “Funniest Comedian” award in Philadelphia’s annual Comedy Awards in both 2012 and 2014. Chip has opened for national headliners such as Louis CK, Dave Chappelle, Bob Saget, and Todd Glass. In 2012, he released his first live comedy album, ACROSS FROM THE ADONIS. 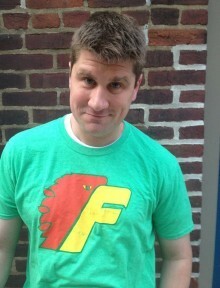 He was also a humor writer for PhillyMag.com, and has written and performed in a number of live and video sketches, including “Deck the Hall and Oates” which VH1.com called “one of the best parodies of the year” in 2011. He also wrote and produced the monthly late night-style talk show, GOOD EVENING w/ CHIP CHANTRY at Helium Comedy Club, and the monthly comedy variety program, CHIP CHANTRY’S ONE-MAN SHOW (w/ special guests! ), at the Philly Improv Theater.